Clove, the incredibly aromatic spice used around the world, boasts an enormous variety of health benefits in addition to its unique flavoring abilities. Clove essential oil has antimicrobial, anti-inflammatory, antiviral and anti-fungal properties that make it an ideal treatment for common ailments like oral health problems, headaches and fungal infections. It can even uplift the mood and act as a repellent to certain insects. Because of its incredible number of uses, clove essential oil is a great product to keep in your medicine cabinet at all times. Clove essential oil has been used for centuries in Eastern medicine as a toothache remedy. In fact, its ability to heal tooth pain was first documented in 1640. Many historians who study ancient Eastern cultures believe that clove was the original toothache remedy, first discovered thousands of years ago (source). To prove clove essential oil’s unique ability to heal toothaches, a study was performed that compared a patient’s pain levels when both clove essential oil and benzocaine, a common topical anesthetic used in dentistry, were applied to patients’ teeth. The result of the study shows that clove essential oil works just as well as benzocaine, numbing the patients’ toothaches and relieving pain quickly (source). Clove essential oil is capable of treating this type of pain because of an ingredient called eugenol that is found in clove buds. It acts both as a natural anti-inflammatory and an anesthetic. Another study shows that eugenol has an incredibly powerful ability to heal oral pain compared to more popular pain relief medications (source). Take the cap off of a bottle of clove essential oil. Pour about three or four drops of the clove oil onto a cotton ball by tilting the bottle and tapping its side with one finger. Place the oil-soaked cotton ball on the affected tooth and bite down. Close your mouth for about five minutes as the oil relieves the toothache. After five minutes have passed, open your mouth and discard the cotton ball. Clove essential oil acts as a carminative which means that it is capable of relieving flatulence. Carminatives work by settling agitated muscles along the digestive tract, allowing gas to pass through more easily. Often, when we eat, certain foods and eating habits cause tension along the muscles of the digestive tract and trap gas inside the intestines. As a result, we experience gas pain and bloating as the gas struggles to release itself from the body. Clove essential oil relaxes the digestive tract entirely so that gas may escape, relieving us of pain and bloating (source). By taking clove essential oil with every meal, you can actually prevent gas from building up in the digestive tract, preventing pain and uncomfortable bloating. Instead, gas will pass through the body with ease. Pour water into a large drinking glass. Using a twisting motion, remove the cap of a bottle of clove essential oil. Tilting the bottle of clove oil at an angle, tap its side with your finger so that about four drops to fall into the water. Mix the two ingredients together with a spoon for about 15 seconds. Consume the glass of water in under one minute. Clove essential oil is incredibly effective when it comes to ridding the body of fungal infections. Common strains of fungus including Candida, which can result from taking too many antibiotics in one’s lifetime or consuming excessive amounts of sugar, can be easily eradicated by ingesting the oil. 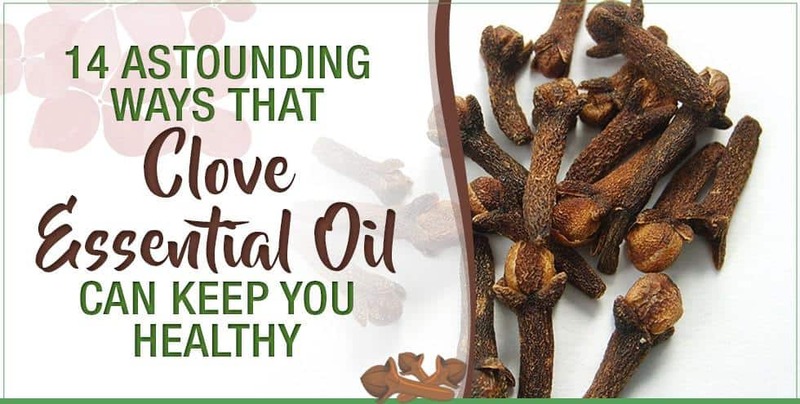 In fact, one study observed clove essential oil’s powerful ability to destroy the cell membranes of Candida fungus, proving the oil’s incredible anti-fungal abilities (source). One study proved that clove essential oil is as effective as nystatin, a popular anti-fungal medication, when it comes to treating fungal infections (source). Another study tested clove essential oil’s ability to prevent fungal infections when applied topically to the skin. The study concluded that the oil has the ability to treat many common fungal infections that occur on the skin including Athlete’s foot (source). Pour water into a tall drinking glass. Twist and lift the cap off of the bottle of clove essential oil. Angling the bottle of oil, lean its spout toward the mouth of the glass. With one finger, start tapping the side of the bottle to pour about four drops of clove oil into the drinking glass of water. Combine the mixture with a spoon for around 15 seconds. Consume the contents of the glass once each day until the symptoms of your fungal infection have gone away. Twist or peel the lid off of a clean, empty 10oz bottle with a spray spout. With a funnel, pour approximately two tablespoons of apple cider vinegar into this spray bottle. After taking the lid off of a bottle of clove oil, position the clove oil bottle upside down and over the mouth of the spray bottle. Shaking the clove oil bottle, release approximately 15 drops into the spray bottle. Fill the rest of the spray bottle with tap water. Tightly twist the lid back onto the spray bottle. Shake this bottle vigorously for around 30 seconds. Spray this anti-fungal solution onto the affected area twice each day until the fungal infection’s symptoms are gone. Because of its unusually high level of flavonoids, clove essential oil can provide fast relief from headaches. Whether it’s a migraine, tension headache or sinus headache, the topical application of clove essential oil can provide relief by acting as an anti-inflammatory and providing a cooling, numbing sensation that permeates the skin and soothes agitated nerves and muscles (source). One study has shown that eugenol, an ingredient that naturally exists in clove, has profound pain-relieving abilities compared to other chemicals that are found in nature. Eugenol is capable of numbing pain and increasing circulation to the muscles that are affected by a headache (source). Clove essential oil is also used in aromatherapy for its stress-relieving abilities. According to statistics, 77 percent of adults in America experience frequent feelings of stress. One of the most common effects of stress is headaches. By using clove essential oil as an aromatherapeutic antidote, headaches can be both treated and prevented (source). Twist off the cap of a bottle of clove essential oil. Turning the bottle upside down, use a tapping motion with your finger against the bottle to release one drop of oil onto your index finger. Massage the clove oil in a circular motion into the skin of your temple. Continue to massage the clove oil until it has all absorbed into the skin. Repeat this process for the other temple. Wait for 20 minutes. If you still haven’t achieved relief from your headache, you may repeat this entire process. Because of its anti-inflammatory properties, clove essential oil can provide relief to patients who experience pain caused by arthritis. Eugeunol, a leading chemical in clove essential oil, acts as a strong pain reliever. One study showed the effects of eugenol when used to treat arthritic rats. The study concluded that eugenol has incredible anti-inflammatory and pain-relieving abilities (source). A second study tested eugenol’s pain-relieving abilities on arthritic mice. The study demonstrated the chemical’s amazing ability to relieve pain quickly and effectively, proving that clove essential oil can be used to treat arthritis pain (source). Clove essential oil is capable of reducing inflammation and encouraging circulation to areas which are affected by pain. By applying the oil topically to the affected area, pain relief can come quickly. Clove essential oil also has numbing abilities. Peel or twist the lid off of a clean and totally empty 10oz plastic bottle. Fill the plastic bottle with a spreadable and loose carrier oil. Examples are sesame oil, sweet almond oil and jojoba oil. You can use a kitchen funnel to pour the oil into the bottle. Using a twisting motion, get the cap off of a bottle of clove oil. 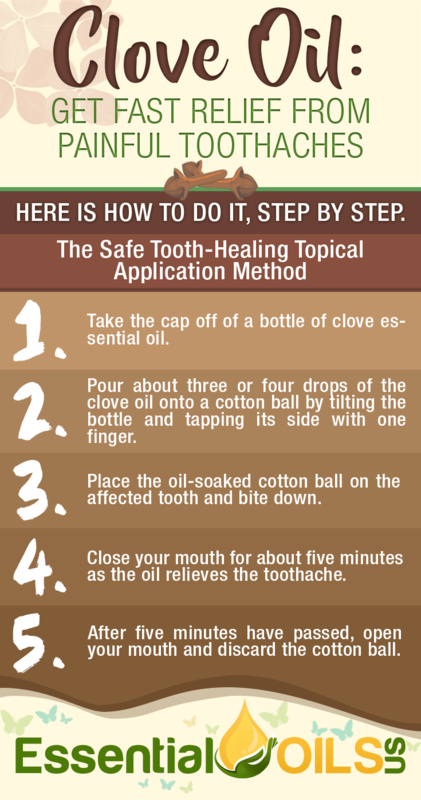 Turn the clove oil bottle upside down and hold it firmly above the plastic bottle’s mouth. Shake the bottle of clove oil, releasing approximately 30 drops into the carrier oil. Tightly screw on the lid of the plastic bottle and shake it aggressively for around 30 seconds. Pour about one tablespoon of the clove oil mixture into the palm of your hand. Rub your two palms together. Massage this clove oil mixture into the affected areas using small circular motions. Keep massaging the clove oil mixture until the skin has totally absorbed it. Clove essential oil can treat a variety of respiratory illnesses thanks to its variety of healing properties. The oil acts as an expectorant that is capable of thinning mucus and phlegm throughout the sinuses, lungs and throat. Therefore, clove essential oil is an effective decongestant (source). The oil’s anti-inflammatory properties can soothe a sore throat and reduce swelling as well. Because clove essential oil is completely safe for adults to ingest, it can be taken orally to treat a sore throat. Additionally, inhaling the vapor of clove essential oil will soothe the entire respiratory tract. Clove essential oil also has antitussive properties which means that it can prevent coughing. When a throat is sore and inflamed, it becomes itchy. As a result, excessive coughing can occur. The oil’s eugenol acts as a numbing agent that will relieve pain, itching and inflammation, giving the patient relief from coughing. Eugenol also acts as a demulcent. A demulcent protects the membranes of the respiratory tract by creating an impenetrable film. As a result, the membranes decrease in irritation and inflammation (source). Because of its antibacterial properties, clove essential oil will also treat bacterial infections that exist in the respiratory tract. One study showed that clove essential oil will treat bacterial lung infections effectively (source). Remove the cap or lid from a clean, totally empty 10oz plastic bottle. Fill this bottle with a loose and spreadable carrier oil like avocado oil, jojoba oil or olive oil. If the mouth of the bottle is small, you may choose to use a small funnel to pour the oil into the bottle. With a firm twisting motion, remove the cap off of a bottle of clove oil. Turn the clove oil bottle upside down and move it directly over the top of the plastic bottle containing the carrier oil. Shake the bottle of clove oil so that about 30 drops fall into the carrier oil. Tightly screw the lid back onto the plastic bottle. Shake it for about 30 seconds. Pour around one or two tablespoons of this clove oil combination into the palm of one hand. Rub both palms together. Using large circular motions, massage this clove oil mixture into the skin on the chest. 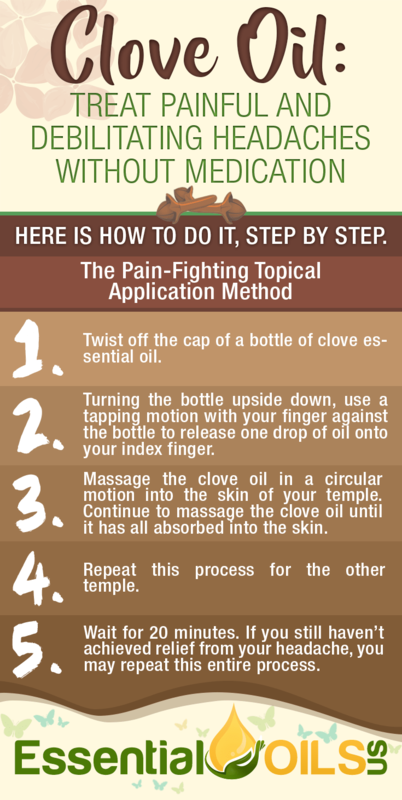 Continue to massage the clove oil mixture into the skin until it has been totally absorbed. Fill a drinking glass with water. Take the lid off of a bottle of clove oil. Tilting the bottle of clove oil, allow its spout to lean toward the water. 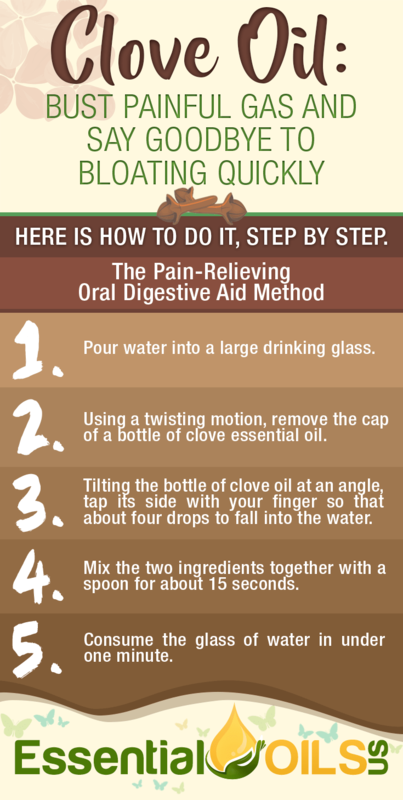 Carefully tap the clove oil bottle’s side with a finger so that about four drops of clove oil fall into the water. Stir the clove oil and water together for approximately 15 seconds. Drink this combination once each day. Studies have shown that clove essential oil can reduce nicotine cravings for patients who are trying to quit smoking. The overwhelmingly negative impacts that cigarettes have on the body are well-documented. Cigarette smoking can cause many illnesses including lung cancer, heart disease and severe respiratory infections. A study showed that when patients inhaled clove essential oil, their cravings for nicotine decreased dramatically. Although the exact cause of this effect is not completely understood as of now, nevertheless it’s important to know that this oil can be highly useful when it comes to quitting smoking (source). 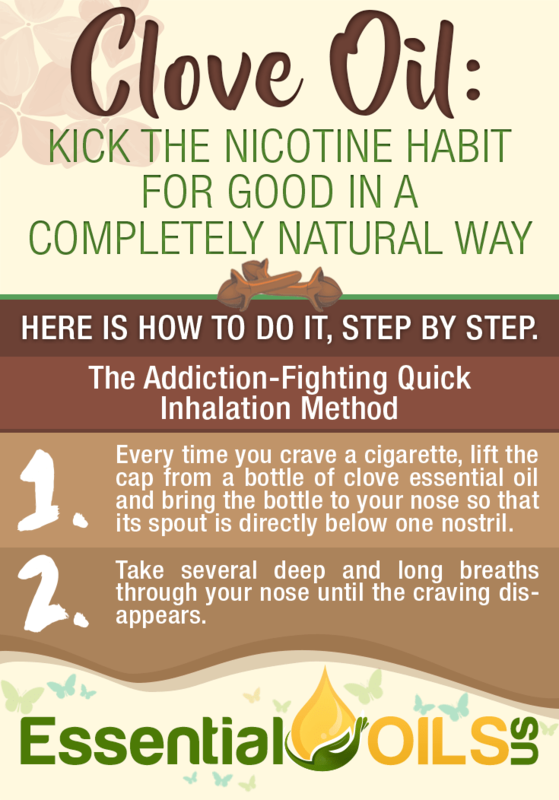 Every time you crave a cigarette, lift the cap from a bottle of clove essential oil and bring the bottle to your nose so that its spout is directly below one nostril. Take several deep and long breaths through your nose until the craving disappears. Clove essential oil has incredible effects on cancer cells. The oil’s high eugenol content makes it especially useful when it comes to killing cancer cells and preventing cancerous tumor growth. The oil has been shown to be capable of killing certain types of breast cancer cells effectively. A 2013 study showed that out of all the essential oils, clove essential oil contains the most eugenol and is therefore highly effective in both killing cancer cells and inhibiting the production of more cancer cells (source). Another study has demonstrated clove essential oil’s unique ability to inhibit the growth of a variety of cancer cells. According to the study, clove essential oil can effectively treat many cancers including ovarian, cervical, colon, pancreatic and liver (source). The oil also has antioxidant properties. Antioxidants effectively prevent cancer by destroying free radicals that enter the body. Free radicals are atoms that are capable of damaging healthy cells. These free radicals are capable of causing cancer over time. However, antioxidants keep cells healthy and protected (source). Clove essential oil has also been shown to inhibit the growth of melanoma cells (source). Pour water into a regular drinking glass. Take the clove oil bottle’s cap off by twisting it. Angling the bottle of clove oil, allow its spout to face the water. Use tapping motions on the side of the clove oil bottle with your finger, letting four or five drops fall into the water. With a spoon, stir the solution for around 15 or 20 seconds. Drink this twice each day. Clove essential oil can treat acne effectively thanks to its unique properties. The oil has anti-inflammatory abilities which can reduce redness, swelling and inflammation of the skin caused by cystic pimples. When cystic pimples develop under the surface of the skin, the face can become swollen as blood rushes to the pimple. By applying clove essential oil directly onto the pimple, signs of inflammation will reduce. A study shows that clove essential oil is also uniquely effective when it comes to killing a bacteria called Propionibacterium that is known for causing acne. By applying the oil topically to the face, pimples caused by this bacteria can diminish (source). 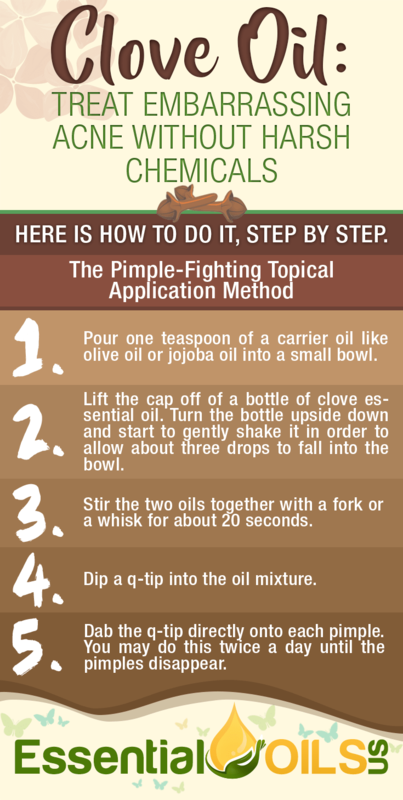 It’s important to dilute clove essential oil when using it to treat acne. People who have sensitive skin may experience irritation if the oil is applied directly to the skin (source). Pour one teaspoon of a carrier oil like olive oil or jojoba oil into a small bowl. Lift the cap off of a bottle of clove essential oil. Turn the bottle upside down and start to gently shake it in order to allow about three drops to fall into the bowl. Stir the two oils together with a fork or a whisk for about 20 seconds. Dip a q-tip into the oil mixture. Dab the q-tip directly onto each pimple. You may do this twice a day until the pimples disappear. Clove essential oil encourages healthy circulation throughout the body. When the oil is applied topically to the skin, it will increase circulation in that area which can reduce pain (source). Clove essential oil’s unique ability to improve circulation is especially useful for those who have chronic circulatory problems. For instance, diabetics often experience a lack of blood flow to the extremities which, in severe cases, can result in amputation. By massaging clove essential oil into the skin of the extremities, proper circulation will be restored. Twist or peel the lid off of a 10oz plastic bottle that is empty. Fill this bottle with a carrier oil that is loose. If you wish, you may do this using a small funnel. Examples of thin carrier oils are jojoba oil, sweet almond oil and sesame oil. After taking the cap off of a bottle of clove oil, turn it upside down and hold it over the mouth of the bottle that is holding the carrier oil. Shake the clove oil bottle to release about 30 drops of oil into the plastic bottle of carrier oil. Place the lid tightly back onto the plastic bottle. Shaking the bottle vigorously for about 30 seconds will mix the two oils together. Pour about a tablespoon of the clove oil mixture into one palm. Rub the palms of your hands together to evenly distribute the oil between both palms. Massage the clove oil mixture into the affected area until your skin has totally absorbed the clove oil. Because of its anti-parasitic properties, clove essential oil has been used for centuries as an insect repellent. In fact, many popular commercial insect repellent sprays that you can find in the grocery store use clove essential oil as a leading ingredient. Common insects like fleas, ticks, bed bugs and mosquitoes are repelled by the scent of clove. Therefore, applying the oil to your skin will keep these bugs away. Clove essential oil also been shown to repel snakes (source). A study showed that a combination of clove and cinnamon essential oils can effectively fumigate a home. Many commercial fumigation techniques rely on chemicals that may be toxic to the body. By using essential oils to rid the home of insects, you can prevent toxic chemicals from lingering in your home (source). After taking the cap off of a clean and empty 20oz spray bottle, give it a good rinse to make sure that it is clean. Fill this clean spray bottle with water. Twist off the lid on top of your bottle of clove essential oil. Place the bottle of clove oil right over the mouth of the spray bottle and turn it over so that its spout is directly facing the spray bottle. Shake the bottle of clove oil so that around 40 drops fall into the water inside the spray bottle. Tightly screw the lid of the spray bottle back on. Shake this bottle for about 45 seconds. You can spray this insect repellent on your body and throughout your home. This insect repellent will also keep insects and snakes out of your garden. Clove essential oil contains antioxidants that act as anti-aging agents for the skin. These antioxidants prevent cell damage caused by free radicals. As a result, skin cells remain healthy and protected and the skin maintains a youthful appearance. Antioxidants also eliminate the appearance of wrinkles and fine lines. Therefore, by applying clove essential oil to the skin, you can reduce the signs of aging (source). It is believed that clove essential oil contains more antioxidant power than any other essential oil. Therefore, this oil is especially useful as an anti-aging agent for skin (source). Twist or peel the lid off of your favorite daily moisturizing product. Using a twisting motion, take off the cap of a bottle of clove essential oil. Tilt the clove oil bottle so that its spout is leaning toward the moisturizing product. With your index finger, lightly hit the side of the clove oil bottle, releasing about six drops into the moisturizing product. Using a little spoon, stir the oil into the moisturizing product. Apply the moisturizing product as you normally do each day. Clove essential oil contains powerful anti-fungal properties. In fact, the oil is capable of killing almost every strain of fungus. Therefore, clove essential oil can effectively kill household mold. When combined with cinnamon essential oil, clove essential oil effectively kills surface molds that can contaminate food. A study has shown the oil’s unique mold-killing abilities (source). Another study has shown the oil’s ability to kill molds that destroy wood (source). Unscrew the top off of an empty 20oz spray bottle. Pour around two tablespoons of raw apple cider vinegar into the bottle using a funnel. Get the cap off of a bottle of clove oil using a twisting motion. Position the clove oil bottle upside down and hold it over the mouth of the spray bottle. Start shaking the bottle of clove oil up and down to release about 30 drops into this spray bottle. Fill the spray bottle to the top with water. Tightly screw the lid back onto the spray bottle and shake the bottle for around 40 seconds. Spray this solution onto any areas in your home where mold exists. Clove essential oil acts as a mental stimulant that can treat clinical depression and anxiety. Like many popular medications for depression and anxiety, the oil boosts cognitive function and improves muscle coordination while treating chronic fatigue and feelings of mental exhaustion (source). Clove essential oil also contains linalool, a chemical compound that has been shown to alleviate stress (source). Put aside the lid of an oil diffuser. Fill the small tank of the oil diffuser with tap water. Fill it to the maximum fill line without exceeding it. After removing the cap from a bottle of clove oil, hold the bottle of clove oil at an angle so that its mouth is close to the water in the tank. Tap one side of the bottle to release about five drops into the tank. Return the lid to the oil diffuser. Plug the diffuser into an outlet that is close to where you are sitting. Place the diffuser on a surface and turn it on by pressing the power button. Sit next to you oil diffuser for about 30 minutes, taking long and deep breaths through your nose. Clove refers to the buds of a tree that is native to Indonesia. For centuries, the intensely aromatic clove buds have been traded around the world both for their health benefits and use as a spice for cooking. The tree from which the buds are removed belongs to the evergreen family. Clove is frequently used in ancient Chinese and Indian Ayurvedic medicine (source). Clove essential oil boasts several unique healing abilities. The oil has anti-fungal, antiviral, antimicrobial, antiseptic, anti-parasitic and anti-inflammatory properties. It also acts as a stimulant and can improve circulation. Many believe that clove is a natural aphrodisiac. Clove essential oil is about 80 percent eugenol. Other compounds include linalool, methyl salicylate and heptyl acetate (source). The steam distillation process is used to produce clove essential oil. Because of the fragility of clove buds, the steam that is pushed through the buds in order to create the oil is low in pressure and temperature. Then, the steam is collected and separated into oil and water. The oil becomes clove essential oil. For thousands of years, clove essential oil has been a staple of traditional Eastern medicine because of its remarkable variety of health benefits. Numerous studies have proven the oil’s ability to relieve pain and digestive disorders, inhibit the growth of cancer cells, treat respiratory problems and kill fungus (source). Clove essential oil is frequently used topically to treat circulatory issues, pain, respiratory conditions and skin conditions such as acne. Often, the oil is diluted in a carrier oil such as olive oil or coconut oil. The oil’s leading ingredient, eugenol, may be irritating to the skin. Therefore, it is advised to dilute the oil especially when applied to the face. The oil can also be inhaled in order to treat respiratory illnesses as well as mood disorders like fatigue and depression. To inhale the oil, you can apply it to the skin so that you are smelling it throughout the day. You may also pour several drops of clove essential oil to a hot bath. As the oil mixes with the steam from the hot water, the oil will permeate the air, allowing you to inhale it deeply. 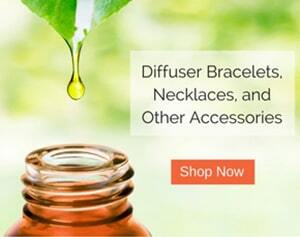 Many people choose to inhale essential oils with an oil diffuser. An oil diffuser is a small device that can fit anywhere in your home. The diffuser is filled with water and several drops of essential oil. Then, the device heats up the water, releasing steam throughout your home. Clove essential oil can be ingested in small doses. This can treat infections that exist in the body as well as digestive problems like gas pains. It’s recommended that clove essential oil is diluted in a liquid like water or honey. Clove essential oil is often applied topically to children to repel insects like ticks and mosquitoes. The oil also acts as a pain reliever that reaches the nerves and muscles through the skin. Clove essential oil is used by adults in order to treat a large number of health conditions including depression, gas pain, respiratory infections and even certain cancers. Is Clove Essential Oil Safe? Overall, clove essential oil is considered to be likely safe when applied topically, ingested and inhaled (source). When applied topically, clove essential oil may cause irritation to the skin and gums. It may cause seizures in children when taken orally. If clove essential oil is consumed in large doses, it may result in poisoning (source). Because clove essential oil may slow blood clotting, patients who take other blood clotting medications may experience increased bruising and bleeding (source). The ingestion, topical application and inhalation of clove essential oil is considered to be likely safe for women who are pregnant. When taken orally, clove essential oil may cause seizures in children. For some children, the topical application of clove essential oil may result in skin irritation. Where can I Buy Clove Essential Oil? Clove essential oil can be found in many stores that carry essential oils including specialty shops and certain grocery stores. This oil can also be purchased from online retailers. Clove essential oil is an incredibly aromatic oil that is capable of treating a large variety of health issues. From cancer to depression, this oil is quite remarkable in its healing abilities.